Anyone remember Meteos? If you think back on that DS classic fondly, you might want to check out Mini Meteors [$2.99], a new iPad-only release. I’ll just say that you’ll find a few similarities between the two. If you have no idea what I’m talking about, let me elaborate. 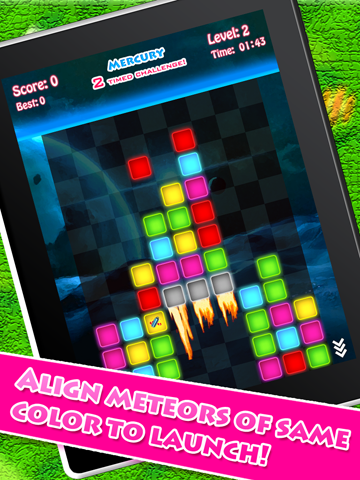 Mini Meteors is a fast-moving match 3–style puzzle game. Unlike your traditional match-3, you can only move blocks up or down. The lines you create can be vertical or horizontal, but you can’t move blocks side to side. The blocks rain down from the top of the field like falling meteors, and you need to move quickly to clear them before they fill up a column. Matching three or more blocks of the same color launches them upwards, along with every block above that match, and anything that flies off the top of the field is cleared. If you’re feeling really good about your skills, you can speed up the falling blocks, but be careful—leave your columns at the top of the field without being launched and you’ll lose. 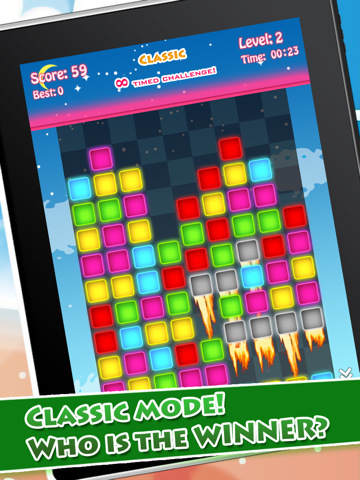 Mini Meteors has two modes: Classic Mode and Mission Mode. In Classic mode, you keep playing until you die, and the game gets harder the longer you survive. Mission Mode mixes things up a bit. You’ll need to defend the planets in our solar system (including Pluto!) for 2, 3 or 5 minutes. Some planets have more gravity, so matched blocks launch slowly or have less lift. Others get hit with faster meteors. Generally, each planet is harder to protect than the last. Mission mode also introduces items that can be collected for Game Center achievements. I’m not sure why you find a stick, leaves and a wood house on Jupiter, but they give you bonus points and you’ll need to collect all of them to fill out the achievement list. Each planet also has its own background image and soundtrack. That’s not quite enough variety, though. Each level feels a bit different, but you need to beat its 2, 3 and 5 minute versions to progress. When you finally move on, you’ll find a level that looks pretty much like the one you just left. It seems like a bit more could be done with creative block designs. That could also help offset the lack of a colorblind mode, something a few members of our forums have requested. A few achievements that aren’t just “collect X" would also be nice. Mini Meteors isn’t the most elegant or original game I’ve played, but it is a good take on gameplay that I haven’t seen before on iOS. 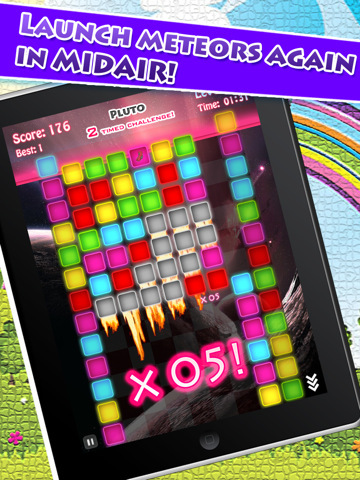 It’s colorful and fun, and I foresee some great competition on the planetary leaderboards once a few more players pick it up. I wouldn’t hold my breath for an iPhone version—the touch controls are precise with the screen real estate of the iPad, but they’d probably be a nightmare on the iPhone without a stylus. But if you’re in the market for something a little different than the average match-3 on iPad, you should definitely take a look.